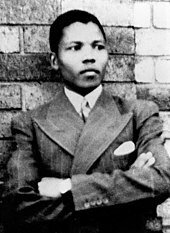 ^ Nelson Mandela - Biography. The Nobel Foundation. 1993 [2009-04-30]. 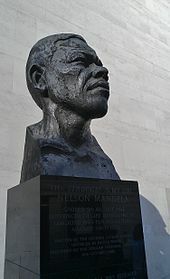 ^ 2.0 2.1 2.2 Nelson Mandela, anti-apartheid icon and father of modern South Africa, dies. CNN. ^ EISA South Africa: The presidency of Nelson Mandela (1994-1999). 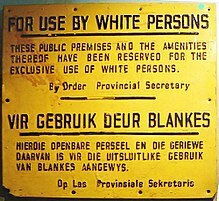 Eisa.org.za. [2011-11-21]. （原始内容存档于2012-01-19）. ^ 9.0 9.1 Mandela 1994，第3页; Sampson 2011，第3页; Smith 2010，第17页. ^ Mandela 1994，第4页; Smith 2010，第16页. ^ 12.0 12.1 Guiloineau & Rowe 2002，第26页; Mafela 2008. ^ Mandela 1994，第8–9页; Sampson 2011，第4页; Smith 2010，第21–22页. ^ Mandela 1994，第7–8页; Sampson 2011，第4页; Smith 2010，第16, 23–24页. ^ Mandela 1994，第12页; Smith 2010，第23–24页. ^ Mandela 1994，第18–19页; Sampson 2011，第5,7页; Smith 2010，第24页; Forster 2014，第91–92页. ^ Mandela 1994，第20页; Sampson 2011，第7页; Smith 2010，第25页. ^ Mandela 1994，第22–25页; Sampson 2011，第7–9页; Smith 2010，第26–27页. ^ Mandela 1994，第25页; Smith 2010，第27页. ^ Mandela 1994，第36–42页; Sampson 2011，第14页; Smith 2010，第29–31页. ^ Mandela 1994，第45–47页; Sampson 2011，第15页; Smith 2010，第31页. ^ Mandela 1994，第52页; Sampson 2011，第17–18页; Smith 2010，第31–32页. ^ Mandela 1994，第53–54页; Sampson 2011，第18–21页; Smith 2010，第32页. ^ Mandela 1994，第56页; Smith 2010，第32页. ^ Mandela 1994，第62–65页; Sampson 2011，第21, 25页; Smith 2010，第33–34页; Meredith 2010，第18页. ^ Mandela 1994，第62–63页; Sampson 2011，第24–25页; Smith 2010，第33–34页; Meredith 2010，第17–18页. ^ Mandela 1994，第67–69页; Sampson 2011，第25页; Smith 2010，第34页. ^ Mandela 1994，第68页; Sampson 2011，第25页; Smith 2010，第35页. ^ Mandela 1994，第70–71页; Sampson 2011，第26页. ^ Mandela 1994，第78–86页; Sampson 2011，第26–27页; Smith 2010，第34–35页; Meredith 2010，第19–20页. ^ Mandela 1994，第73–76页; Sampson 2011，第27–28页; Smith 2010，第36–39页. ^ Mandela 1994，第89–94页; Sampson 2011，第29–30页; Smith 2010，第40页. ^ Mandela 1994，第96–101页; Sampson 2011，第30–31页; Smith 2010，第41页. ^ Mandela 1994，第104–105页; Sampson 2011，第32–33页; Smith 2010，第43, 48页. ^ Mandela 1994，第106页; Smith 2010，第48–49页. ^ Mandela 1994，第122–123页; Sampson 2011，第37页; Smith 2010，第48页. ^ Mandela 1994，第100页; Sampson 2011，第34页; Smith 2010，第44页. ^ Mandela 1994，第99, 108–110页; Sampson 2011，第33页; Smith 2010，第44–45页. ^ Mandela 1994，第113–116页; Sampson 2011，第33页; Smith 2010，第45–46页. ^ Mandela 1994，第118–119页; Sampson 2011，第34页. ^ Mandela 1994，第116–117, 119–120页; Sampson 2011，第33页; Smith 2010，第47页. ^ Mandela 1994，第122, 126–27页; Sampson 2011，第34页; Smith 2010，第49页. ^ Mandela 1994，第127–131页; Sampson 2011，第34–35页; Smith 2010，第64–65页. ^ Mandela 1994，第136页; Smith 2010，第53页. ^ Mandela 1994，第137–139页; Sampson 2011，第38–39页; Smith 2010，第53页. ^ Mandela 1994，第142–143页; Smith 2010，第54页. ^ Mandela 1994，第139–143页; Sampson 2011，第39–41页; Smith 2010，第52–56页. ^ Mandela 1994，第144, 148–149页; Sampson 2011，第36页; Smith 2010，第59–62页. ^ Mandela 1994，第149, 152页; Sampson 2011，第36页; Smith 2010，第60–64页; see also Honouring Thembekile Mandela. 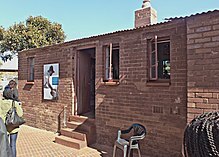 Nelson Mandela Centre of Memory. Nelson Mandela Foundation. 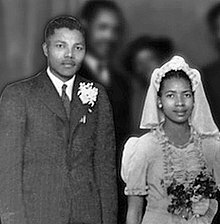 [2013-12-08]. .
^ Mandela 1994，第150, 210页; Sampson 2011，第36页; Smith 2010，第67页. ^ Mandela 1994，第151页; Smith 2010，第64页. ^ Mandela 1994，第153–154页; Sampson 2011，第48页; Smith 2010，第66页. 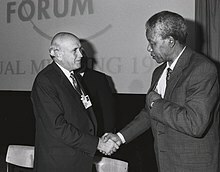 ^ Mandela 1994，第154页; Sampson 2011，第42页. ^ Mandela 1994，第154–157页; Sampson 2011，第49页; Smith 2010，第66页. ^ Mandela 1994，第159–162页; Sampson 2011，第51–52页; Smith 2010，第70–72页. ^ Mandela 1994，第162–165页; Sampson 2011，第53–55页; Smith 2010，第72–73页. ^ Sampson 2011，第35页; Smith 2010，第68–70页. ^ Mandela 1994，第168页; Sampson 2011，第55–56页. ^ Mandela 1994，第165–167页; Sampson 2011，第61–62页; Smith 2010，第74–75页. ^ Mandela 1994，第176页; Sampson 2011，第63–64页; Smith 2010，第78页. ^ Mandela 1994，第177–172页; Sampson 2011，第64–65页; Smith 2010，第75–76页. ^ Mandela 1994，第170页; Smith 2010，第94页. ^ Mandela 1994，第182–183页; Sampson 2011，第66–67页; Smith 2010，第77, 80页. ^ Mandela 1994，第183–188页; Sampson 2011，第69页; Smith 2010，第81–83页. ^ Mandela 1994，第188–192页; Sampson 2011，第68页. ^ Mandela 1994，第194–195页; Sampson 2011，第72–73页; Smith 2010，第85页. ^ Mandela 1994，第195–198页; Sampson 2011，第71–72页; Smith 2010，第83–84页. ^ Mandela 1994，第199–200, 204页; Sampson 2011，第73页; Smith 2010，第86页. ^ Mandela 1994，第205–207, 231页; Sampson 2011，第81–82, 84–85页; Smith 2010，第116–117页. ^ Mandela 1994，第209–210页; Sampson 2011，第7页; Smith 2010，第87页. ^ Mandela 1994，第210–216页; Sampson 2011，第77–80页; Smith 2010，第87–93页. ^ Mandela 1994，第293–294页; Sampson 2011，第76–77页; Smith 2010，第98–99, 105–106页. ^ Mandela 1994，第218–233, 234–236页; Sampson 2011，第82–84页; Smith 2010，第120–123页. ^ Mandela 1994，第226–227页; Sampson 2011，第84页; Smith 2010，第118页. ^ Mandela 1994，第243–249页; Sampson 2011，第87–95页; Smith 2010，第118–120, 125–128页. ^ Mandela 1994，第253–274页; Sampson 2011，第96–99页; Smith 2010，第130–132页. ^ Mandela 1994，第275页; Sampson 2011，第101–102页. ^ Mandela 1994，第296页; Sampson 2011，第110页; Smith 2010，第102–104页. ^ Mandela 1994，第306–311页; Sampson 2011，第110–113页; Smith 2010，第104, 132–145页. ^ Mandela 1994，第283–292页; Sampson 2011，第103–106页; Smith 2010，第163–164页. ^ Mandela 1994，第299–305页; Sampson 2011，第116–117页; Smith 2010，第167–168页. ^ Mandela 1994，第331–334页; Sampson 2011，第122–123页; Smith 2010，第167页. ^ Mandela 1994，第327–330页; Sampson 2011，第117–122页; Smith 2010，第171–173页. ^ Mandela 1994，第342–346页; Sampson 2011，第130–131页; Smith 2010，第173–175页. ^ Mandela 1994，第347–357页; Sampson 2011，第132–133页; Smith 2010，第175页. ^ Mandela 1994，第357–364页; Sampson 2011，第134–135页; Smith 2010，第177页. ^ Mandela 1994，第373–374页; Sampson 2011，第140–143页; Smith 2010，第183–185页. ^ Mandela 1994，第377–380页; Sampson 2011，第143页; Smith 2010，第178页. ^ Mandela 1994，第283–287页; Sampson 2011，第144–146, 154页; Smith 2010，第186–188, 193页. ^ Mandela 1994，第289–291页; Sampson 2011，第147–149页; Smith 2010，第188–189页. ^ Mandela 1994，第393–396页; Sampson 2011，第150–151页; Smith 2010，第206–210页. ^ Mandela 1994，第397–398页; Sampson 2011，第151–154页; Smith 2010，第209–214页. ^ Mandela 1994，第397–409页; Sampson 2011，第154–156页; Smith 2010，第191, 222–229页. ^ Umsebenzi Online, Volume 12, No. 42. Sacp.org.za. 2013-12-06 [2014-07-18]. ; Marrian, Natasha. SACP confirms Nelson Mandela was a member. Business Day. 2013-12-06 [2013-12-07]. ^ Mandela 1994，第413–415页; Sampson 2011，第158–159页; Smith 2010，第239–246页. ^ Mandela 1994，第418–425页; Sampson 2011，第160–162页; Smith 2010，第251–254页. ^ Mandela 1994，第427–432页; Sampson 2011，第163–165页; Smith 2010，第255–256页. ^ Mandela 1994，第432–440页; Sampson 2011，第165–167页; Smith 2010，第256–259页. ^ Mandela 1994，第441–443页; Sampson 2011，第167–169页; Smith 2010，第259–261页. ^ Mandela 1994，第443–445页; Sampson 2011，第169–170页; Smith 2010，第261–262页. ^ Mandela, Nelson. I am prepared to die. 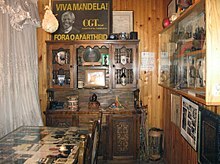 Nelson Mandela Centre of Memory. Nelson Mandela Foundation. [2013-12-16]. ^ Mandela 1994，第435–435页; Sampson 2011，第170–172页; Smith 2010，第275–276页. ^ DAVID JOHNSTON. C.I.A. TIE REPORTED IN MANDELA ARREST. The New York Times. 1990-06-10. The report, scheduled for publication on Sunday, quoted an unidentified retired official who said that a senior C.I.A. officer told him shortly after Mr. Mandela's arrest: We have turned Mandela over to the South African Security branch. We gave them every detail, what he would be wearing, the time of day, just where he would be. ^ Mandela 1994，第456–459页; Sampson 2011，第172–173页. ^ Mandela 1994，第463–465页; Sampson 2011，第173–174页; Smith 2010，第292–293页. ^ Mandela 1994，第468–482页; Sampson 2011，第174–176页. ^ Mandela 2004，第27–32页; Sampson 2011，第183–186页; Smith 2010，第292–295页. ^ Mandela 2004，第33–42页; Sampson 2011，第186–190页. ^ Mandela 2004，第42–57页; Sampson 2011，第190–194页; Smith 2010，第300–302页. ^ Mandela 2004，第62页; Sampson 2011，第194–195页; Smith 2010，第303页. ^ Mandela 2004，第63–68页; Sampson 2011，第196–197页; Smith 2010，第306页. ^ Mandela 2004，第75–78页; Sampson 2011，第204页; Smith 2010，第307–308页. ^ Mandela 2004，第79–80页; Sampson 2011，第205页; Meredith 2010，第279页. ^ Mandela 2004，第126页; Sampson 2011，第205, 258页; Meredith 2010，第299页. ^ Mandela 2004，第102–108页; Sampson 2011，第205页; Meredith 2010，第283页. ^ Mandela 2004，第83, 90, 136–138页; Meredith 2010，第284, 296–298页. ^ Sampson 2011，第210–214页; Meredith 2010，第298–299页. ^ Sampson 2011，第236–241, 288–294页; Meredith 2010，第292–295页. ^ Sampson 2011，第232页; Meredith 2010，第301, 313页. ^ Sampson 2011，第229页; Meredith 2010，第295, 299–301页. ^ Sampson 2011，第221页; Meredith 2010，第301–302页. ^ Sampson 2011，第222页; Meredith 2010，第337页. ^ Sampson 2011，第241页; Meredith 2010，第334页. ^ Sampson 2011，第246–247页; Meredith 2010，第303–304页. ^ Hutton, Barbara. Robben Island: Symbol of Resistance. Bellville: Pearson South Africa. 1994: 60. ISBN 0868774170. ^ Sampson 2011，第222, 235页; Meredith 2010，第301页. ^ Sampson 2011，第223–225页; Meredith 2010，第308–310页. ^ Sampson 2011，第242–243页; Meredith 2010，第317页. ^ Sampson 2011，第259–276页; Meredith 2010，第324–327页. ^ Sampson 2011，第277–283页; Meredith 2010，第327–328页. ^ Sampson 2011，第319–320页; Meredith 2010，第338–339页. ^ Sampson 2011，第324–325页; Meredith 2010，第340页. ^ Sampson 2011，第324–325页; Meredith 2010，第346–347页. ^ Sampson 2011，第326页; Meredith 2010，第347页. ^ Sampson 2011，第335–336页; Meredith 2010，第341–346页. ^ Sampson 2011，第338–342页; Meredith 2010，第249–256页. ^ Sampson 2011，第330–332页; Meredith 2010，第351–352页; Mandela's response to being offered freedom. ANC. [2008-10-28]. （原始内容存档于2008-06-22）. ^ Sampson 2011，第343–345页; Meredith 2010，第358页. ^ Sampson 2011，第347–355页; Meredith 2010，第359–360页. ^ Sampson 2011，第363–378页; Meredith 2010，第362–368页. ^ Sampson 2011，第368页; Ketchum, Mike. The Mandela Concert, Wembley 1988. 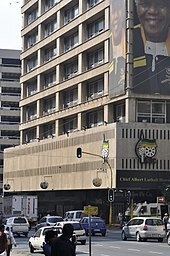 African National Congress. [2008-12-23]. （原始内容存档于2008-07-09）. ^ Sampson 2011，第373–380页; Meredith 2010，第371–383页. ^ Sampson 2011，第369–370页; Meredith 2010，第369页. ^ Sampson 2011，第381页; Meredith 2010，第369–370页. ^ Sampson 2011，第384–385, 392–393页; Christopher S. Wren. 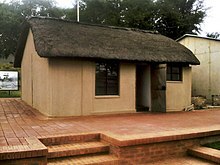 Mandela Moved to House at Prison Farm. The New York Times. 1988-12-08 [2013-02-13]. （原始内容存档于2013年2月14日）. ^ Sampson 2011，第386页; Meredith 2010，第388页. ^ Sampson 2011，第390–392页; Meredith 2010，第387–388页. ^ Sampson 2011，第399–402页; Meredith 2010，第369–397页; 1990: Freedom for Nelson Mandela. BBC. 1990-02-11 [2008-10-28]. （原始内容存档于2013年2月26日）. ^ Sampson 2011，第407页; Meredith 2010，第399–402页; Ormond, Roger. Mandela free after 27 years. The Guardian (London). 1990-02-12 [2008-10-28]. （原始内容存档于2013年2月26日）. ^ Sampson 2011，第408–409页; Meredith 2010，第400–402页; The text of Mandela's speech can be found at Nelson Mandela's address to Rally in Cape Town on his Release from Prison. ANC. 1990-02-11 [2008-10-28]. （原始内容存档于2008-07-28）. ^ Sampson 2011，第409–410页; Meredith 2010，第403–405页. ^ Sampson 2011，第412–414页; Meredith 2010，第409–410页; ITN Source website: "...Mandela onto stage...". Itnsource.com. 1990-04-16 [2012-12-27]. （原始内容存档于2013年2月14日）. ^ Sampson 2011，第420页; Meredith 2010，第410页. ^ Sampson 2011，第424–427页; Meredith 2010，第412–413页. ^ Sampson 2011，第429–430页; Meredith 2010，第439–440页. ^ Sampson 2011，第431, 448页; Meredith 2010，第409页. ^ Sampson 2011，第436–442页; Meredith 2010，第418–424页. ^ Sampson 2011，第444页; Meredith 2010，第425–426页. ^ Sampson 2011，第456–459页; Meredith 2010，第443–446页. ^ Sampson 2011，第461–462页; Meredith 2010，第462–463页. ^ Sampson 2011，第462–463页; Meredith 2010，第466–467页. ^ Sampson 2011，第463–467页; Meredith 2010，第467–471页. ^ Sampson 2011，第472页; Meredith 2010，第489–491页. ^ Sampson 2011，第466, 470–471页; Meredith 2010，第449–450, 488页. ^ Sampson 2011，第468–469页; Meredith 2010，第476–480页. ^ Sampson 2011，第474页; Meredith 2010，第494页. ^ Sampson 2011，第434–445, 473页; Meredith 2010，第497页. ^ Cunningham, Matthew. Creme cameos. The Guardian (London). 2004-06-03 [2008-10-26]. （原始内容存档于2013年2月14日）. ^ Sampson 2011，第467–477页; Meredith 2010，第495页. ^ Sampson 2011，第478页; Meredith 2010，第495–496页. ^ Sampson 2011，第477–478页; Meredith 2010，第484页. ^ Sampson 2011，第488页; Meredith 2010，第500–501页. ^ Sampson 2011，第491页; Meredith 2010，第512页; Glen Levy. Top 10 Political Prisoners. Time. 2010-11-15 [2013-03-25]. （原始内容存档于2013年3月25日）. 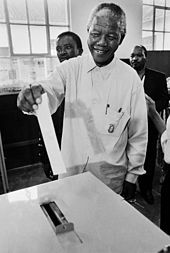 ^ Sampson 2011，第490页; Meredith 2010，第510–512页; This Day in History: April 27, 1994: South Africa holds first multiracial elections. History. [2013-02-26]. （原始内容存档于2013年2月26日）. ^ Sampson 2011，第492–493页; Meredith 2010，第514页. ^ Sampson 2011，第492页; Mandela becomes SA's first black president. BBC. 1994-05-10 [2008-05-26]. （原始内容存档于2013年2月25日）. ^ Sampson 2011，第508–511页; Meredith 2010，第566页. ^ Sampson 2011，第496–497页; Meredith 2010，第523, 543页. ^ Sampson 2011，第517页; Meredith 2010，第543页. ^ Sampson 2011，第525–527页; Meredith 2010，第547–548页. ^ Sampson 2011，第503页; Meredith 2010，第495页; Khumalo, Fred. How Mandela changed SA fashion. BBC. 2004-08-05 [2008-10-28]. （原始内容存档于2013年2月25日）. ^ Sampson 2011，第500, 507页; Meredith 2010，第539–542页. ^ Sampson 2011，第546–549页; Meredith 2010，第574–575页. ^ Sampson 2011，第495–496页; Meredith 2010，第517页. ^ Sampson 2011，第511, 534页; Meredith 2010，第528页. ^ Sampson 2011，第520, 522–523页; Meredith 2010，第523–524页. ^ Sampson 2011，第491, 496, 524页; Meredith 2010，第517, 536页. ^ Sampson 2011，第528–532页; Meredith 2010，第527, 551–564页. ^ Sampson 2011，第532页; Meredith 2010，第563页. ^ Sampson 2011，第514–515页; Meredith 2010，第519页. ^ 243.0 243.1 Houston & Muthien 2000，第62页. ^ Meredith 2010，第521页; Leatt, Annie; Shung-King, Maylene; and Monson, Jo. Healing inequalities: The free health care policy (PDF). Children's Institute. [2011-05-15]. （原始内容存档 (PDF)于2013年2月26日）. ^ Land Redistribution: A Case for Land Reform in South Africa. NGO Pulse. 2010-02-10 [2011-11-21]. （原始内容存档于2013年2月26日）. ^ Land Reform Policies in South Africa Compare To Human Rights Internationally (PDF). [2012-02-11]. （原始内容 (PDF)存档于2012年3月31日）. ; No. 3 of 1996: Land Reform (Labour Tenants) Act, 1996. South African Government Online. 1996-03-22 [2013-02-26]. （原始内容存档于2013年2月26日）. ^ Faculty of Commerce at the University of Cape Town (PDF). Commerce.uct.ac.za. 2007-04-25 [2012-12-27]. （原始内容 (PDF)存档于2012-02-03）. ^ 249.0 249.1 249.2 Why workers should vote ANC. Cosatu.org.za. [2012-10-27]. （原始内容存档于2013年2月26日）. ^ Meredith 2010，第571–573页; Sampson, Anthony. Mandela at 85. The Observer (London). 2003-07-06 [2008-05-26]. （原始内容存档于2013年2月26日）. ; Can Mandela's AIDS Message Pierce the Walls of Shame?. Peninsula Peace and Justice Center. 2005-01-09 [2008-05-26]. （原始内容存档于2013年2月26日）. ; Quist-Arcton, Ofeibea. South Africa: Mandela Deluged With Tributes as He Turns 85. AllAfrica. 2003-07-19 [2008-05-26]. （原始内容存档于2013年2月26日）. ^ Sampson 2011，第510, 565–68页; Meredith 2010，第573页. ^ Sampson 2011，第510页; Meredith 2010，第544–547页. ^ Sampson 2011，第558–559页; Thai, Bethuel. Lesotho to hold re-elections within 15 to 18 months. Lesotho News Online. 1998-10-04 [2008-05-26]. （原始内容存档于2013年2月26日）. ^ Sampson 2011，第563–564页; Analysis: Lockerbie's long road. BBC. 2001-01-31 [2008-05-26]. （原始内容存档于2013年2月25日）. ^ Sampson 2011，第534页; Meredith 2010，第529–530页. ^ Sampson 2011，第537–543页; Meredith 2010，第568页. ^ Sampson 2011，第549–551页; Meredith 2010，第576页. ^ Battersby 2011，第587–588页; Meredith 2010，第576页. ^ Battersby 2011，第588–589页; Meredith 2010，第576页. ^ Battersby 2011，第590–591页; Meredith 2010，第584–586页. ^ Nelson Mandela Invitational Tees Off. GaryPlayer.com. 2003-11-14 [2008-10-27]. （原始内容存档于2013年2月25日）. ^ Battersby 2011，第598页; Mandela 'responding well to treatment'. BBC. 2001-08-15 [2008-05-26]. （原始内容存档于2013年2月25日）. ^ XV International AIDS Conference – Daily Coverage. Kaisernetwork. 2004-07-15 [2008-10-27]. （原始内容存档于2013年2月25日）. ^ Weir, Keith. Equipo Nizkor – Mandela slams Western action in Kosovo, Iraq. Derechos.org. Reuters. 2003-04-13 [2010-10-03]. （原始内容存档于2013年2月25日）. ^ ByJarrett Murphy CBS 30 January 2003, 1: 34 PM. Mandela Slams Bush On Iraq. Cbsnews.com. 2003-01-30 [2013-12-13]. ^ Battersby 2011，第591–592页; Pienaar, John. Mandela warns Bush over Iraq. BBC. 2002-09-01 [2008-10-27]. （原始内容存档于2013年2月25日）. ; Cornwell, Rupert. Mandela lambastes 'arrogant' Bush over Iraq. The Independent (London). 2003-01-31 [2008-10-27]. （原始内容存档于2013年5月2日）. ; Fenton, Tom. Mandela Slams Bush on Iraq. CBS. 2003-01-30 [2008-05-26]. （原始内容存档于2013年2月25日）. ^ Battersby 2011，第598页; Meredith 2010，第593页; I'll call you. SouthAfrica.info. 2004-06-02 [2008-05-26]. （原始内容存档于2013年2月25日）. ^ 285.0 285.1 Keyes, Allison. Mandela, Bush Discuss Education, AIDS in Africa. NPR. 2005-05-17. （原始内容存档于2013年6月26日）. ^ 286.0 286.1 Hennessey, Kathleen. The Obama-Mandela dynamic, reflected in a photo. Los Angeles Times. 2013-06-25. （原始内容存档于2013年6月26日）. ^ Battersby 2011，第600页; Mandela joins 'Elders' on turning 89. MSNBC. Associated Press. 2007-07-20 [2008-05-26]. （原始内容存档于2013年2月25日）. ; Mandela launches The Elders. SAinfo. 2007-07-19 [2008-10-27]. （原始内容存档于2013年2月25日）. ^ 289.0 289.1 Nelson Mandela Celebrates 90th Birthday by Urging Rich to Help Poor. Fox News Channel. 2008-07-18 [2008-10-27]. （原始内容存档于2013年2月25日）. ^ Bingham, John. Hyde Park concert to mark Mandela's 90th. The Independent (London). 2008-05-06 [2008-10-27]. （原始内容存档于2013年2月25日）. ^ Battersby 2011，第594–597页; Meredith 2010，第598页. ^ World Cup 'perfect gift for SA'. 11 May 2004 (7 March 2015). BBC News. ^ Battersby 2011，第600页; Batty, David. Nelson Mandela attends World Cup closing ceremony. The Guardian (London). 2010-07-11. （原始内容存档于2013年2月25日）. ^ Polgreen, Lydia. Messy Fight Over Mandela Trust Goes Public. New York Times. 2013-05-24. ^ David Smith in Johannesburg. South African courts step in over Mandela family burial row. London: The Guardian. 2013-07-03 [2013-07-05]. ^ Moreton, Cole. Nelson Mandela's grandson Mandla accused of grave tampering. London: Telegraph. 2013-07-02 [2013-07-05]. ^ 4 July 2013 at By Henriette Geldenhuys. Affidavit points out Mandla's 'master plan'. IOL.co.za. [2013-07-05]. ^ Battersby 2011，第607页; Nelson Mandela 'breathing on his own'. News 24. 2011-01-18 [2011-01-30]. （原始内容存档于2013年2月25日）. ^ Jon Gambrell. Mandela Has Lung Infection, South African Officials Say. The Huffington Post. Associated Press. 2012-12-11 [2012-12-11]. （原始内容存档于2013年2月25日）. ; Mandela Has Surgery for Gallstones. The New York Times. 2012-12-15 [2012-12-15]. （原始内容存档于2013-02-25）. ^ Nelson Mandela, 94, responding positively to treatment in hospital | CTV News. Ctvnews.ca. 2013-03-28 [2013-06-10]. ^ Nelson Mandela arrives home in ambulance. London: The Telegraph. 2013-04-06 [2013-04-06]. ^ 304.0 304.1 Nelson Mandela hospitalized in serious condition. CNN. 2013-06-08 [2013-06-08]. ^ Nelson Mandela's Condition Becomes Critical. Sky News. [2013-06-23]. ^ Karimi, Faith; Norgaard, Kim. Nelson Mandela in critical condition, South Africa's presidency says. CNN. 2013-06-23 [2013-06-23]. ^ Nelson Mandela in critical condition. Al Jazeera. 2013-06-23 [2013-06-23]. ^ Associated Press. South Africa: Anti-apartheid leader Nelson Mandela's condition has turned critical. The Washington Post. [2013-06-24]. （原始内容存档于2013-06-24）. ^ AFP 2. Mandela wished a 'peaceful end' by Cape Town Archbishop. London: Telegraph.co.uk. 2013-06-26 [2013-07-05]. ^ Zuma Cancels Trip Amid Mandela Worry. ABC News. [2013-06-26]. ^ Nelson Mandela released from hospital. CNN. 2013-09-01 [2013-09-01]. ^ Mandela discharged from South Africa hospital. Al Jazeera. 2013-09-01 [2013-09-01]. ^ 名人传记： 《南非斗士曼德拉》第二十二章　“释放曼德拉” 互联网档案馆的存檔，存档日期2011-07-21. ^ 谷歌涂鸦纪念曼德拉诞辰的语录. 中国日报. 2014-07-18 [2014-07-19]. Aikman, David. Great Souls: Six Who Changed a Century. Lexington Books. 2003. ISBN 0-7391-0438-1. Mandela, Nelson. The Illustrated Long Walk to Freedom. Paul Duncan (abridgement and picture editing). Boston: Little, Brown and Company. 1996. ISBN 0-316-88020-5. A Prisoner in the Garden: Opening Nelson Mandela's Prison Archive. Penguin Books. 2005. ISBN 0-14-302495-7. Desmond Tutu ; edited by John Allen. The Rainbow People of God: The Making of a Peaceful Revolution. Doubleday. 1996. ISBN 978-0-385-48374-2. Benson, Mary. Nelson Mandela: The Man and the Movement. Bezdrob, Anne Marie du Preez. The Nelson Mandela Story. Samoja Books. 2006. ISBN 0-620-36570-6. Denenberg, Barry. Nelson Mandela: No Easy Walk To Freedom. Juckes, Tim. Opposition in South Africa: The Leadership of Matthews, Nelson Mandela, and Stephen Biko. Westport, Connecticut: Praeger Publishers. 1995. Mandela, Nelson. Long Walk to Freedom. Little, Brown and Company. 1995. ISBN 0-316-54818-9. Meredith, Martin. Nelson Mandela: A Biography. Anthony Sampson. Mandela: The Authorised Biography. New York: Vintage Books. 1999. ISBN 0-679-78178-1. Smith, Charlene. Mandela: In Celebration of a Great Life. Richard Stengel. Mandela's Way: Fifteen Lessons on Life, Love, and Courage. Crown Publishing Group. 2009. ISBN 978-0-307-46068-4. Villa-Vicencio, Charles. The Spirit of Freedom. Berkeley, California: University of California Press. 1996.